Why Choose Alabama Hidden Dog Fence? Why Choose Alabama Hidden Dog Fence? We are The Dog Fence Experts™! Why choose a high-pressure, scripted sales routine and deal with a corporation based hundreds of miles from your home, when you could have a local professional with Alabama hidden dog fence who is dedicated to providing you with not only the best in hidden pet containment, but also dedicated to providing a personal sales experience that will suit your needs and not a corporate bottom line. Making sure you get the quality service you deserve matters a lot to us – that’s why Alabama Pet Fence is the best local choice for pet containment, earning a living not by relying on a company name, but by earning referrals from our valued customers. We have been installing the American Made Pet Stop Brand and repairing the Underground Dog Fence for about 16 years in Opelika and Auburn areas. Why Choose Pet Stop® Brand Products? Pet Stop Products like our Eco-Lite® Rechargeable Receivers are underground dog Fence Compatible. The product is the only Professional Series Receiver on the market with a 25 Year rechargeable Battery. The Eco-Lite is the lightest weight and the smallest physical size, at only 3/4 ounce, it is ideal for any dog, but especially dogs under 35 pounds where a small, light weight collar really makes a difference. All Pet Stop® products are made in the USA, by the most experienced underground dog fencing experts in our industry. Pet Stop Brand Hidden Fence Products are manufactured in Morgantown PA through Perimeter Technologies. Our staff is made up of people who geniunely care about the health and well-being of your pets. Pet Stop® is dedicated to constantly improving pet fencing technology and holds more patents than any other electronic dog fencing brand. 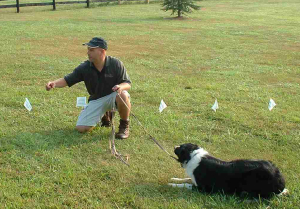 Hidden Electronic Dog Fence Training: Our unique GentleSteps™ Training method works wonders, providing a humane approach to quickly and easily introduce your pet to the new fence. Utilizing the latest technology, Pet Stop® is designed to provide the least amount of stress possible. When used with Pet Stop’s highly customizable and advanced pet fencing products, we can customize your pet’s learning experience to what best suits their needs – young or elderly, timid or excitable, there’s an available adjustment for whatever kind of dog you have. Our approach is so gentile, we start puppies out at 10-12 weeks of age. No matter what breed, what application or what temperament, Pet Stop guarantees 100% safe dog containment. Pet Stop Quality Electronic Dog Fencing Products: All Pet Stop® collars and transmitters are backed by a standard full lifetime warranty. Any replacement charges, such as shipping and handling, are nominal, so even should a piece of equipment need to be replaced, you’ll never be required to pay full retail price again. All components are covered for the cost of the component – no questions asked!